TOTW 20 left a lot of FUT players demanding more, the top names simply weren’t performing and hence the lineup was incredibly weak. 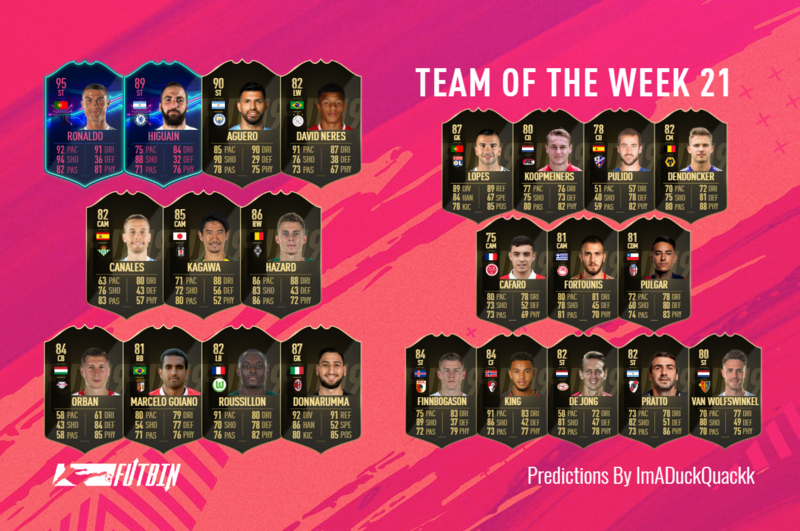 Fear not though FIFA lovers, as TOTW 21 is absolutely stacked with potential, and could potentially provide one of the best lineups to date! It was only last week that this man made our predictions, yet for some reason we simply cannot stop finding reasons to include him within this list. Roma and AC Milan shared the points this week with a 1-1 draw, a match that could have ended very differently if it wasn’t for the heroics of this young Italian. The problem we have here is the lack of a clean sheet, however the numerous top class saves alongside the way he controlled his backline, feels like he has outdone himself here, especially against such a high calibre of opponent. Over to Germany next, where Wolfsburg were on the road as they travelled to Hertha Berlin for their Bundesliga fixture. The game itself was incredibly tight, with just a single goal separating the two sides at the final whistle. Roussillon may not have been the goal scorer on the day, however he was the man who provided the assist, while being denied by the woodwork for one himself. When we combine this with the great performance and clean sheet too, he is in with a serious chance of an upgrade this week. Braga were away to Aves for their weekend fixture this week, and after a fantastic performance they left with the points after a 2-0 win. Goiano took the man of the match award from his right back position, with a sensational 90 minutes, a goal to his name and a clean sheet. In a week where finding defenders was particularly tough, he may very well have done enough to make the final cut. Leipzig continued their dominant push towards the top of the Bundesliga with an incredible 3-0 away victory against Hannover this week. There isn’t any debate about the man who stole the show here, with Orban putting in a world class performance from start to finish. Dominating the defence, ensuring the clean sheet and finding the back of the net not once but twice, Orban has done literally everything within his power to secure his spot this week. Over to Spain now, where we find an inform Atletico Madrid away to Real Betis. The match was never going to be a walk in the park for the visitors, but i think most people expected them to be leaving with the points come the final whistle. The hosts however had other plans, playing a fantastic strategy to perfection across the entire match. In the end it was a penalty in favour of the hosts that separated the two sides, and Canales was the man who tucked it away. Onto one of the recent transfers now, and a very popular nomination within these predictions. Kagawa recently joined Besiktas on loan from Dortmund, where the attacking midfield had a debut to remember. Besiktas planned on easing him into the squad, giving Kagawa just 9 minutes on the pitch during their 6-2 win over Antalyaspor. This didn’t bother the player though, as 9 minutes was more than enough to find the back of the net not once, but twice! Ajax continued their incredible form this season with another absolutely massive win over VVV-Venlo on the weekend. The hosts took the points with a 6-0 result, and like any game that provides this much action, we had a whole heap of potential TOTW candidates on our hands. Both Ziyech and Beek managed to secure a goal and an assist each, however Neres came off the bench to find 2 assists and a goal in just 17 minutes. Personally, we feel that this is his time to shine! A slightly more interesting selection now as we head back to Germany and the Bundesliga. Gladbach secured the points with a 3-0 away win against Schalke on the weekend. Hazard was once again in sensational form, and while he may not have managed to score, there are a whole heap of reasons as to why he deserves this spot. Taking the man of the match award, earning a perfect match rating and providing 2 assists show just how brilliant he was, and for us this is enough for a spot amongst the elite this week. It’s been a difficult year for Higuain, if we are completely honest it’s been difficult since leaving Juventus. He’s found the back of the net occasionally, but has been far from the dominant force we have grown to know. After a midweek disaster against Bournemouth, Chelsea came back in style with a 5-0 home win over Huddersfield on the weekend. Hazard was sensational as usual, however the nomination has to go with Higuain, who scored twice and could be seeing the first upgrade on his brand new Chelsea OTW card. In what was probably seen as the spotlight match of the week, Manchester City played hosts to the travelling Arsenal, with both sides needing the points for very different reasons. City struck first, but Arsenal were Quick to respond, and with the game tied at 1-1, us Liverpool fans were fully behind Arsenal. Aguero however has other plans, as after scoring the opener he then went on to find his second and third, securing the points, picking up his hat-trick and taking home the match ball. So here it is, the moment everybody has been waiting for. Well, at least we believe this is the time! After a handful of matches with 2 goals, plenty of top class performances and a fantastic scoring record this season, we are into February without a single Inform from Ronaldo. Juventus drew 3-3 with Parma this week, and while the result wasn’t ideal, we cannot take anything away from Ronaldo's performance. With 2 goals and an assist, surely, hopefully, this is the week where he finally gets that boost to his OTW card. Onto the bench now, and probably the toughest spot to fill amongst these predictions. If anyone beats PSG in the league, 9 times out of 10, an Inform would be the next logical step. Lyon did exactly this on Sunday, with goals from Dembele and Fekir in a 2-1 victory. The problem now is that giving an Inform for a single goal is a big ask, especially from a striker or s penalty, and although Lopes was the run away hero, his Inform from TOTW 19 gives us doubts that he gets this deserved recognition. AZ Alkmaar took the points with a 5-0 home victory against FC Emmen this week. Koopmeiners was a rock in defence, leading from the back, controlling his defence and also adding plenty towards the attacks too. Koopmeiners scores twice on the day, both from the spot, but we cannot take anything away from him here. A clean sheet and 2 goals from any center back, should be more than enough to send them straight into the 23 man squad. Back across to Spain now, where we take a look at the Friday fixture between SD Huesca and Real Valladolid. The game itself provided fans with 4 goals, but sadly for the visitors all 4 goals were in favour of the hosts. We were left with a variety of potential nominations, but with a clean sheet and a goal to his name, we opted to go with Pulido. We’ve mentioned it before, but this week midfielder selections are really lacking, which has left us looking for those with a single goal combined with a sensational performance. Dendoncker ticks both of these boxes, and with Wolves 3-1 win over Everton on the weekend, he jumps into these predictions with a position change card. Reims were 2-1 winners at home to Marseille this week, in a game that gave the home fans plenty to shout about. Cafaro may not have managed to find the net himself, however his two assists and man of the match performance was enough for us to give him a spot. However, I have a sneaky suspicion that Golovin could end up stealing this spot come Wednesday. Olympiakos picked up the points with a dominant win over Panionios this week. The match finished 4-0 to the hosts, and one man's performance was nothing short of spectacular. Fortounis showed his ability from start to finish, absolutely hammering the opposition's goal with shot after shot, and was ultimately rewarded with his hat-trick, alongside a place within our predictions this week. Once again we come across that awkward decision, does a striker get an Inform for a single goal, or a midfielder for the assist? Bologna pulled off a shock 1-0 away win to Inter Milan on Sunday, and while Santander scored the goal, Pulgar provided the assist and took the top rating. The question that remains, is whether a single assist will be enough this week. PSV continued their incredible performances this season with a 5-0 thrashing over Fortuna Sittard on the weekend. There were plenty of great performances for us to choose from, but one man finished miles ahead in the ranks. With 3 goals, a perfect match rating and one hell of a performance, Luuk de Jong claims this spot with both hands. Back to Germany once again now, where we find yet another hat-trick within these predictions. Augsburg were comfortable 3-0 winners over Mainz this week, taking all 3 points and creating a hero in the process. Finnbogason was simply sublime, scoring not once, not twice, but three times to secure his hat-trick. The fact that two of these goals came from the spot is irrelevant, a hat-trick is a hat-trick and deserves to be treated accordingly. Now we know that this was a mid-week game, and that it’s a roll of the dice as to whether EA include these or not, but how could we possibly ignore a 4-0 home win for Bournemouth over Chelsea? King was absolutely sensational in this match, scoring twice, providing an assist for a third, and securing a perfect match rating along the way. We know it was on Wednesday, but give this man his second inform! River Plate were on the road this week where they picked up all 3 points with a dominating 4-0 win over Godoy Cruz on Thursday. Pratto was in magnificent form on the day, terrorising defenders from the start and constantly creating chances. He finished the match so close to his hat-trick, with 2 goals and an assist, which we believe is more than enough to warrant his inclusion within our nominations. Basel picked up the win with a 4-0 thrashing away to Zurich this week. While the squad performed fantastically, there was only one man who stole our attention, Van Wolfswinkel. He was on fire from the start, constantly giving everything, dominating the attacks and providing nothing but nightmares for the oppositions defence. This was directly shown in the stats as well, with not one, not two, but three goals under his belt, and a very likely inform this week too.